Emily was born in 1787 at Rodez, France. She was educated at Villefranche, became a teacher at the age of 18 and, realizing that many of the children of the poor were not going to school because they could not afford to, she opened a school for them and taught without charge. She also began to consider religious life, but after entering three or four congregations for a short time, she realized that she was not called to any of the existing orders. Emily devoted all of her life to teaching the poor and gathered other young women to help her cope with the rapidly growing numbers of children in her school. These women also gave all their lives to teaching the children and became the nucleus of the Religious Congregation of the Holy Family of Villefranche. The congregation was devoted to caring for the elderly, prisoners, and orphans, in addition to the schools for the poor. Some of the nuns were also contemplative and spent their time in prayer and adoration. She died of cancer at Villefranche on September 19, 1852. 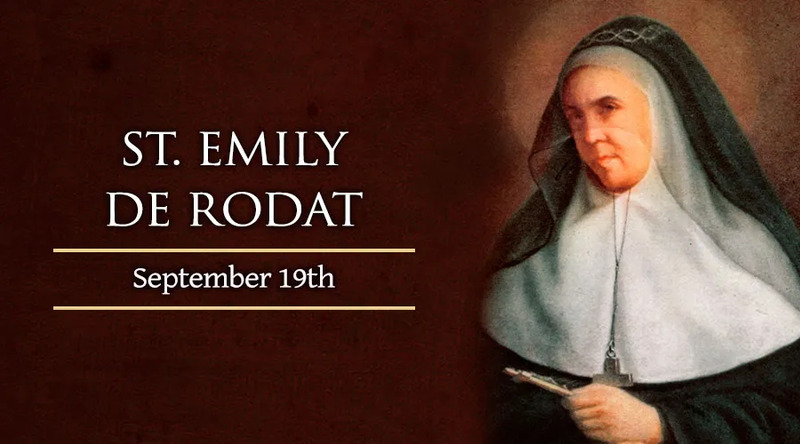 At the time of her death Saint Emily de Rodat had opened 38 charitable institutions. Saint Emily was canonized in 1950 by Pope Pius XII.